For CQWPX CW 2013 Iain M0PCB entered Single-Op 15m Low Power Assissted and although band conditions were poor and only 176 QSOs were logged G9V came first in England. Equipment was an Elecraft K3, 100W and a G3TPW Cobwebb from the M0PCB home station. 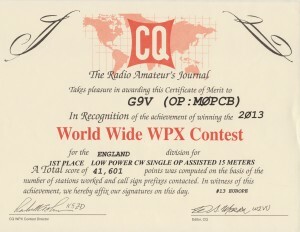 In February 2013 Darrell G0HVQ operated in the CQWPX RTTY contest Single-Op all band low power. 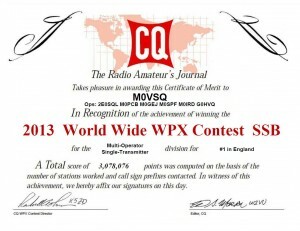 With a score of 838,859 points from 686 QSOs he took 2nd place in England, 50th in Europe and 87th in the World. 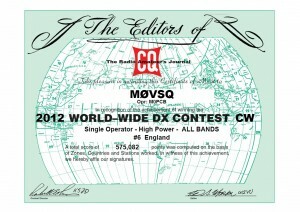 In 2012 Darrell G0HVQ entered CQWW SSB using the M0VSQ call sign. With 1053 QSOs and 593,025 points he won the Single-Op All Band High Power category for England. CQWW CW 2012 was run from the shack of Iain M0PCB in the Single-Op All Band High Power section. 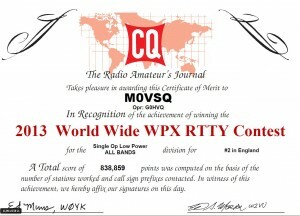 Overall, with 575,082 points from 1053 QSOs we got 6th place in England.